Struggling with Amazon EDI Requirements? You have been invited to Amazon Vendor Central, Great! But what do you do next? Let us help you set it up. What Are The Benefits of Amazon Vendor Central EDI Services? EDI eliminates time consuming activities related to order processing. Paperwork, filing, time, and human error are costs you’re enduring when operating without proper EDI services. Unfamiliarity can cause mistakes. Our experienced teams excel in EDI services, from the implementation process to establishing parameters aligned with Amazon’s strict EDI requirements. By allowing our qualified specialists to perform EDI services, you’re saving time and money. We help reduce processing expenses such as printing, copying, filing, storage, and mailing. It’s simple; you can’t sell on Amazon Vendor Central without EDI. Last year alone, third-party Amazon sellers generated nearly $32 billion of revenue, accounting for 52% of all Amazon products sold online. If you want to join this growing market, then you need to get EDI compliant first. Our award-winning services will get you EDI compliant through our quick integration process. 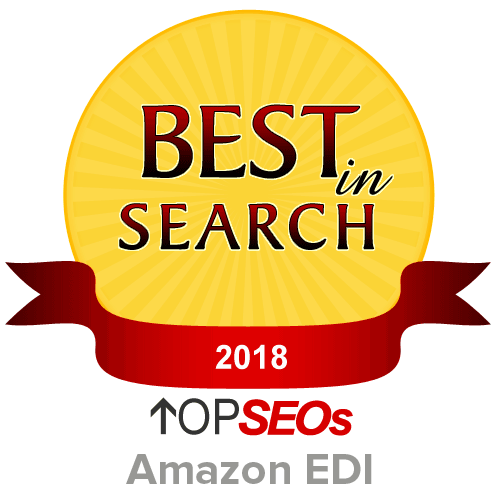 As a marketing powerhouse on retainer for global, big brand names, SEO Brand’s EDI platform integration is fast and reliable. You can’t sell without EDI, so get trusted, industry-recognized solutions to streamline your transactions. Efficient communications that will expedite any transition period, so your Amazon EDI services can begin immediately. Start eliminating logistical concerns, and enjoy the benefits of having a real-time, efficient EDI management team. Using our EDI services, our teams will track products from the moment they’re sold and enable the safe exchange of data necessary to complete processing and delivery on time, without having to establish long-term gateways. Capable teams will consistently provide clients with updated, analytical reports that summarize information relating to sales, purchasing, inventory, processing, and other performance indicators. Get real-time, visible reports of transactional and operational EDI data relevant to your company’s performance. Specialists are ready to administer reports allowing you to examine sales history, invoices, order receipts, and revenue generation. Losing Business Because You Don’t Have A Proper EDI Connection? Our Team of Amazon Integrators Will Make Your Business EDI Capable For Amazon! You have made the right step to become EDI compliant to trade documents with Amazon. Get in touch with us today to see how painless of a process we can make it for you!